At least $200,000 3rd party liability insurance is required by the Provincial Government if you ride on any Forest Service Roads in BC, whether they are deactivated or active. For individual 3rd party liability insurance, there are two ways to go - insurance yourself for operating any machine or insure the machine. BCORMA has teamed up with OASIS Insurance to provide great coverage for off-road riders. Platinum-Insured Trail Pass - $2million or Bronze-Insured Trail Pass - $500,000 of insurance and support the trails for a great deal! Insurance coverage is to December 31, 2018 - Buy in October and get up to 15 months of insurance for the price of 1 year! Simple, Fast, and a great deal. Get your insurance right away without driving to and waiting .. waiting ... at broker. BCORMA member clubs can purchase $5 million 3rd party liability insurance for $6.50/member, plus $5.00 per km of trails the club wants liability coverage on through Oasis Insurance. It covers non-racing events including Trials contests. Contact BCORMA and we will provide you an Oasis Insurance application for your club to get 3rd party liability insurance. 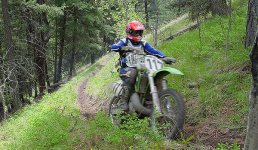 For Enduro and Hare Scramble event insurance, please contact the Pacific Northwest Motorcycle Association, BC's off-road motorcycle racing organization.